Dr. Michael Balcomb and Archbishop Ki Hoon Kim are inaugurated. Dr. Michael Balcomb and Archbishop Ki Hoon Kim presented Rev. 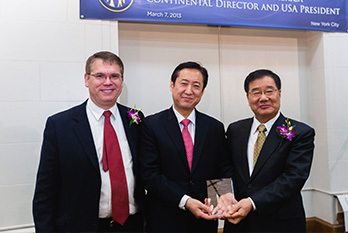 Moon Shik Kim with an award honoring his work in the United States. Newly-inaugurated President of the Family Federation for World Peace and Unification (FFWPU), Dr. Michael Balcomb (UTS ’94 and ’09), has called upon Unificationists to “make all things anew” by preaching and teaching the Divine Principle. Dr. Balcomb spoke at an inauguration ceremony at the Learning Center (4 West 43rd Street) in New York City on March 7, 2013. Rev. Moon Shik Kim (UTS’01) was specially acknowledged by Archbishop Kim and Dr. Balcomb for his “many years of dedicated service to God’s providence in America and [his] exemplary standard as True Parents’ representative” and was wished the “greatest success” in his new mission as the National President of Canada. “Our Heavenly Supreme Parents, how can we begin to express our deepest gratitude and appreciation for having gifted humanity with the substantial presence of the True Parents of Heaven Earth and Humankind, to bring salvation to our world through restoration and creation? You have blessed us beyond all measure that we could be living witnesses of the presence of the Savior, the Messiah and the returning Lord and that we could breathe the same air that they breathe as they come to transform the world and especially, this nation. We feel Your blessing. We experience the true love, the true life and the true lineage that our True Parents have brought to our world, and each one of us is a better person for having crossed their paths. Our destiny has changed, our lives have changed, and our purpose has been birthed anew. To close the ceremony, Rev. Ki Yeal Lee of the Korean Evangelical Association (KEA) USA led three cheers of Eog Mansei. “In Las Vegas, True Mother was proclaimed by True Father to be perfectly one with True father. In his final address that Father gave more than a thousand times, he made it very clear that a providential moment that occurred in Las Vegas was the perfection of oneness of True Parents. And that perception can never diminish or dwindle. Perfection is forever. Because of that, Mother was at the victorious Seonghwa, and she is now standing as the embodiment of True Father, in Father’s spirit, heart and word. “With that vision and leadership, True Mother has now called for three primary nations, Korea, Japan and United States, to establish a kind of leadership that has been trained by Father. Archbishop Ki Hoon Kim is now our Continental Director. Michael Balcomb is our new president. We are here for this historic occasion to honor True Parents and True Parents’ leadership and decision to go forward to establish 20 nations that will be central to expanding Cheon Il Guk. “Archbishop Ki Hoon Kim is a man who is chosen by God for this special moment in history. When we were in Cheon Pa Dong Church with the District Pastors a few years ago, he took us behind the old Cheon Pa Dong church that True Father had first established in Seoul and showed the little quarters, separate from the main house. He said, ‘This is where I lived. My aunt joined as an early member, and I lived here with True Parents.’ That awakened to me why True Father and True Mother feel so close to Archbishop Kim. “Archbishop Kim was guided by Heaven to come to America, and then went to the seminary under Father’s direction. He became a district director in Philadelphia. He went on to be the national leader of Canada. Then he became the district director of Chicago. It was there that he established the True Family Values Banquet, which True Parents started attending. Then, True Father launched the American Clergy Leadership Conference with Archbishop Kim and Dr. Chang Shik Yang, Archbishop George Augustus Stallings and Bishop Edwards responded to that call. And it was in that vision also that Father launched the 50 state tour in 2001. He called Archbishop Kim first right after the True Family Values Banquet in 2000 and said suddenly, ‘We have to go to all 50 states with the clergy.’ That created a revolution. “From there, Father called Bishop Kim to be the Continental Director and the chairman of Universal Peace Federation. He was made to be the head of organizations of many dispensations by Father directly. Then Father suddenly asked him to attend Las Vegas. And for three years he attended the Las Vegas providence. So, whether he had a title that gave him global authority or whether he had a spiritual authority, he always served and always obeyed Father. “It was his lifeline connection to the American movement that allowed us to give many incredible testimonies and reports to Father. Because more than anything, Bishop Kim loves our members. Our first-, second- and third-generations. His testimony is one of giving and forgetting. Living for the sake of others. It was amazing to see how much love he would pour out for people unconditionally, again and again. And I think that is why he is here before us this day. “What True Father and Mother want us to inherit is True Father’s spirit of continuing and carrying on. Now is a ‘portion of responsibility’ era. The era of ‘just following directions’ is over. Let us take ownership as leaders. We all own Cheon Il Guk. “So, I really want to ‘thank you’ for what you have done for the sake of True Parents and for the sake of this country. I will try together with you to cultivate the spirit of prayer and kindness and service. We have to find out for ourselves how precious we are. Let us create a culture of heart. “We’ve heard the word ‘new’ a lot this morning. It’s a short word, but if you’re like me, you’re probably thinking, well ‘How?’ How are we going to make a new America, a new kingdom, when there has been such a long history of suffering and difficulty? Even Father himself gave his entire life without actually seeing the full realization of Cheon Il Guk. “How does God make all things new? The same way God made things in the first place. According to the Principle and the Holy Book, God made all things through the Word. It is in the Word of God that the universe itself was called into being. Adam and Eve were supposed to be the Word substantiated. Jesus called himself the ‘Word made flesh,’ and Father’s last speech on this earth was the ‘Declaration by God’s Substantial Word.’ The Word of God, brothers and sisters, is the key. It is from that that we can make all things anew. “When I met Mother back in October and again recently, she reiterated her own belief and confidence that in the fundamental word, the Divine Principle and the eight textbooks, is the key to Cheon Il Guk. [Back in October] I didn’t really believe that the Principle had the power to unwind all the difficulties and struggles of history, and Mother kept saying, ‘In the early days, the Principle would be heard in the church at all times, and that’s what I want.’ But when I came back to America, I said, ‘I have to try this.’ If I was going to ask people to believe in the power of the Word, I had better try it for myself. That’s what I’ve been doing these last four or five months. I really encouraged and trained brothers and sisters to have confidence and teach the Principle themselves. “When Mother asked me to be the voice of the Principle, to preach it and teach it, I don’t think she was talking about just me. I believe she was asking everyone to become new and revived. I can testify to you from my own and recent experience that it works. The Principle is the thing that distinguishes us from all other churches. It is God’s revealed word for the salvation for all of his children. And don’t get me wrong – I’m not saying that we’re better than other churches. We’re certainly not the biggest – we’re one of the smallest. I believe God has raised up tremendous champions waiting in all those megachurches and mosques and temples. But he’s given us the special responsibility, the key to unlock the truths of all those traditions and faiths. If we don’t have confidence in what we’ve been given through True Parents, then they will continue to wait. by Ariana Moon and Krista Karjalainen.